You just joined a Domestic Cleaning agency and they have told you that you will need to provide the cleaning products yourself. Where do you start? Everyone can get a little bit paranoid on the supermarket shelves trying to decide if the citrus-super-lime scale remover is better than the paradise-ocean-fragrance-bleach. All those chemicals with ammonium quaternary compounds or phthalates or who-knows-what that look like mini atomic bombs in colourful bottles. It is always good to start thinking about what it is more important for you: sparkling clean or environmentally friendly? You actually have three choices in regards to cleaning products: conventional cleaning products, green or environmentally friendly products, and traditional products. Conventional cleaning chemicals are available to customers with almost no information about their potential consequences for human health. Still there are thousands of customers willing to buy those products so they can have the most glimmering house at all costs. Some of these cleaning products have been proofed to cause occupational asthma as well as other allergies and derived illnesses. This may be the main reason for a growing number of people willing to switch their cleaning products for a better alternative. Still indecisive? Let me give you some facts. The only chemicals that green or environmentally products cannot match in terms of strength are those that contain chlorine, such as bleach. In those cases, the green products need a little bit more of manual help (yes, scrubbing). Another fact: You do not need chemicals to clean (not kidding). These cleaning products that we often buy make the domestic cleaning task easier, but not better. In fact, the well known e-cloth will leave your windows even more sparkling than a conventional window cleaner. Last fact (an old one): My grandmother used to say that “a person is not cleaner because they clean a lot but because he or she tries not to make everything dirty”. What a truth! Obviously it will take you longer to clean the cooker if you leave it full of sticky grease, debris and rests of food for one month instead of wiping it every day. The good news are that to change your domestic cleaner into an “environment freaky” you do not need to force her into mixing up pastes and solutions to clean the toilet bowl. You can always switch to the environmentally friendly chemicals we mentioned before. Still not convince about the prices of those so called “green products”? Then maybe you can think about buying conventional cleaning products on a more conscientious way. Let us see how. Just a bottle of washing up liquid will do the trick, at the end of the day we do not have our daily showers with bleach and antibacterial soap! Why do we need to do differently for our house? If you feel that buying only washing up liquid is too drastic a change and still find the need to buy more than one bottle of don’t-remember-the-name super cleaning chemical, then go with the basic ones: general cleaner, lime scale remover and a polisher (if needed). This way you will reduce your exposure (and your domestic cleaner’s exposure) to unnecessary strong chemicals. 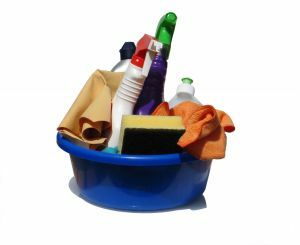 Your domestic cleaner can help you a lot on deciding which chemical is the best, as she has the knowledge of years of house cleaning. Most probably if you ask her she will choose, by experience, the softest chemicals on the market. At the end of the day deciding which chemical to buy is not about which product is the best but how we use it. This entry was posted in Cleaning products and tagged cleaning chemicals, cleaning products, cleaning products to use, domestic cleaner, domestic cleaning, domestic cleaning agency, green products on 25/11/2008 by admin.